Let’s call it an uncommon first trip to Kyoto since it fits all three definitions of the word: 1. out of the ordinary; 2. unusual; 3. remarkably great. Stop here if you do not like futuristic architecture. Kyoto (literally “Capital City”) does not need any introductions. The capital of Japan for more than a millennium from 794 to 1868, it is regarded as the country’s most beautiful city. As such, it is uniformly portrayed as the epitome of traditional architecture. The expected activities include visiting temples, shrines, the imperial palace, and gardens with a sprinkle of fine dining and shopping. Perhaps, stamina permitting, a hike or a bicycle ride is in the cards too. Unlike the majority of Kyoto’s visitors, we had a luxury of 10 more weeks staying in the Land of the Rising Sun. There was no need to pack everything the ancient capital has to offer in one-, two- or even three-day trip. We could come as many times as we want to patiently discover all the treasures. Hence, we agreed that our first visit would be a reconnaissance mission: how far can we walk in a stifling heat of a city jungle, would a bicycle be a better choice to move around the city or would we need a bus to speed up our excursions. 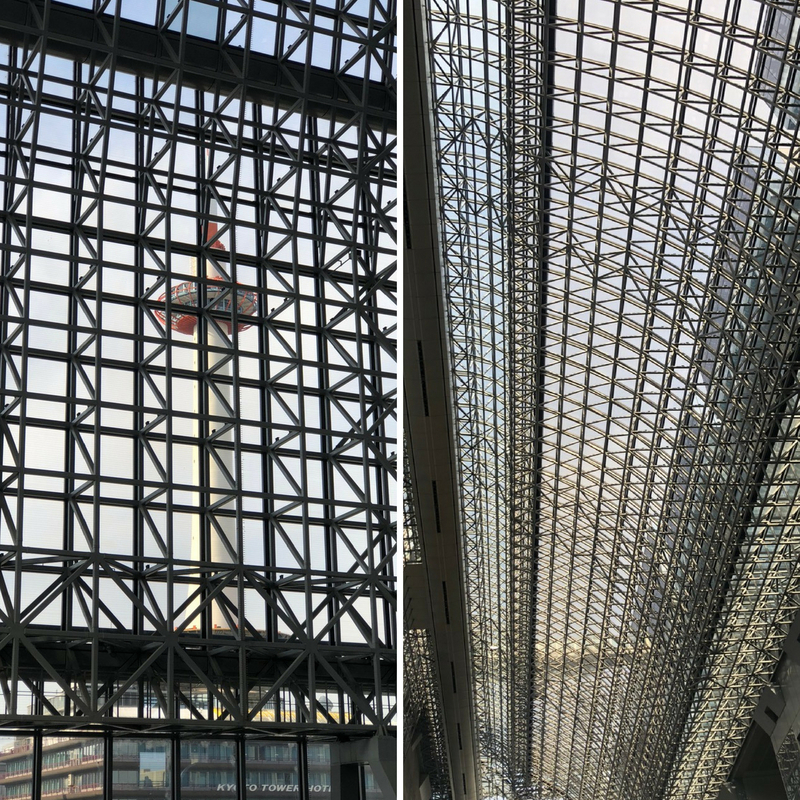 The enormous atrium of Kyoto Station. Ultimately, we failed to fulfill the purpose of the trip. We arrived by train to Kyoto Station. 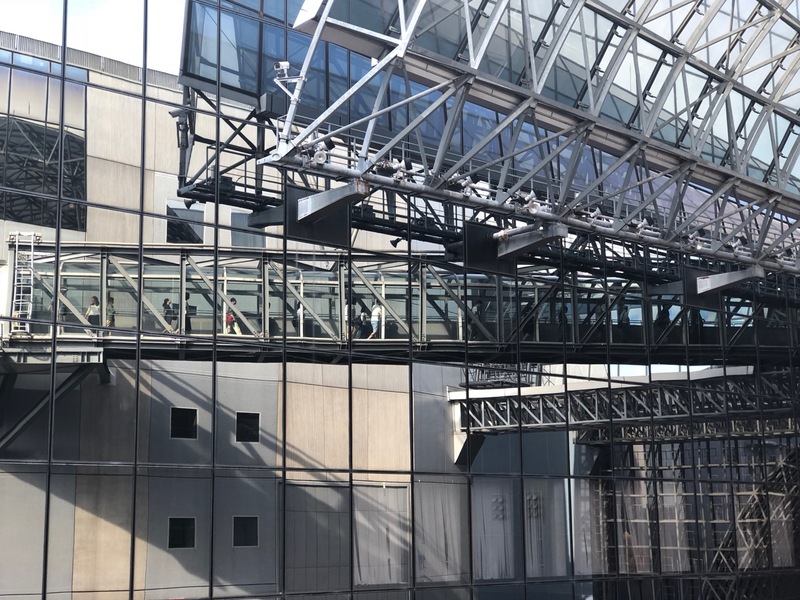 Walking through the platforms, we noticed a sign Sky Garden —>. Brilliant! Who can resist taking a look at the unfamiliar city from above? Breaking from the crowd determined to leave the building as soon as possible, we crossed the atrium and started the ascent to the garden by riding a seemingly endless succession of escalators. 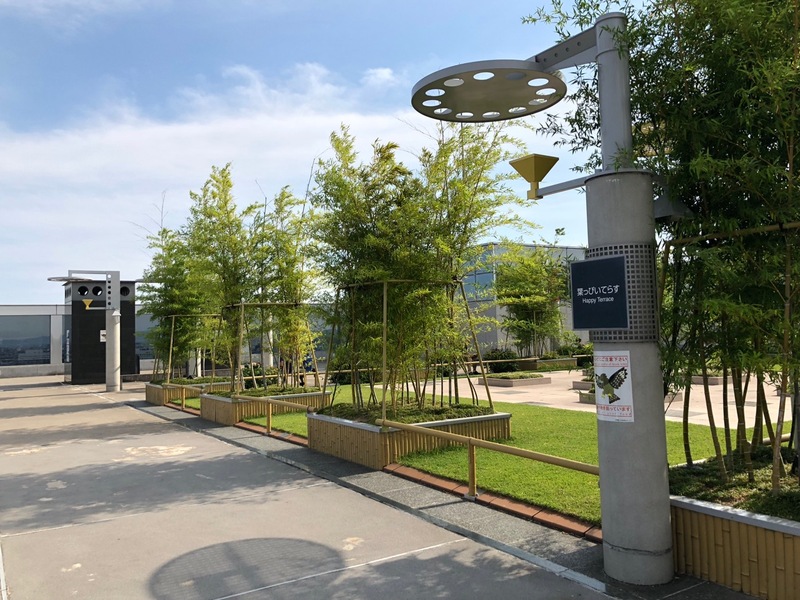 The station’s exposed steel beamed roof, called the Matrix, is meant to reflect both the structure of the station and the grid-like layout of Kyoto’s streets. An accidental look around… Ok, to say that my jaw fell to the floor would be an understatement. I think that this gem of modern architecture must be listed as one of the main attractions of the centuries-old city. Interestingly, I found it to be more exciting from inside. The exterior looks contemporary without too much flare. 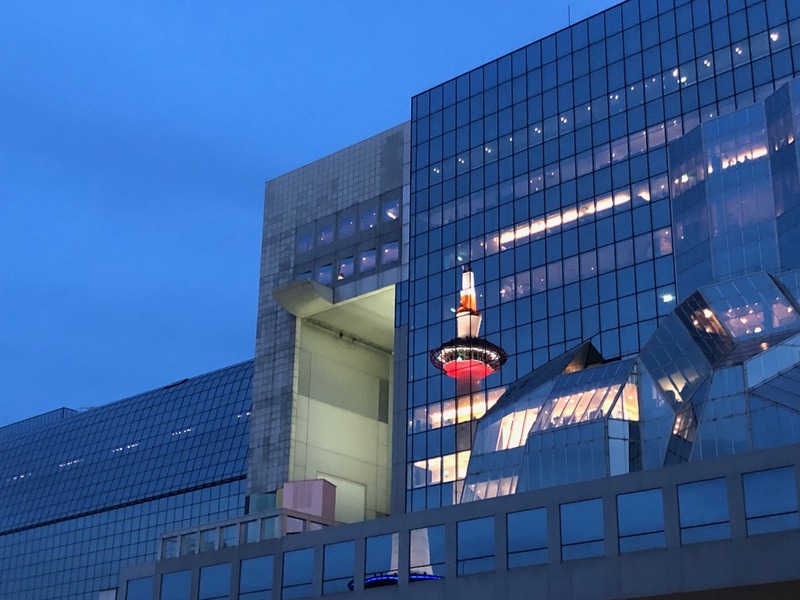 Though, after the sunset, the reflection of the Kyoto Tower superimposed on the facade made it the perfect postcard-like picture. Back to daylight, the interior of the building is stunning. An intricate lace married an industrial efficiency of space engineering, and here is their offspring. The mirrored walls multiply reflections for even more striking effect. It is the feast for the eyes. Couple days later, browsing through the photos of the station I realized that they convey what impressed us the most. For example, there is no panoramic view of the famous staircase. No doubt, it is outstanding both, in size and execution, but… it just didn’t make the cut. After all, we were not aiming for an Architectural Digest type of photoshoot. A person who never saw the station may not get the entire picture so to speak. For this reason, here is a link to the article in Japanese with tons of photos of the complex. Google Translate does a fair job, but the text reflects author’s feelings more than provides any new information. Does the striking design of the station refer to extensive studies of indigenous villages of Africa? 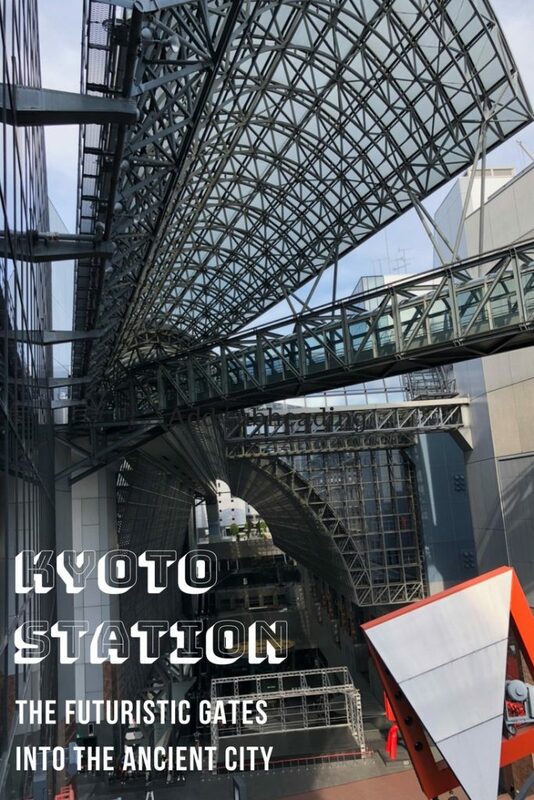 The life story of Kyoto Station began in 1877 when a modest red brick building marked the new step in the technological progress of the time. The opening was a big event attended by the Emperor. The number of passengers steadily grew during next few decades demanding a more suitable facility. 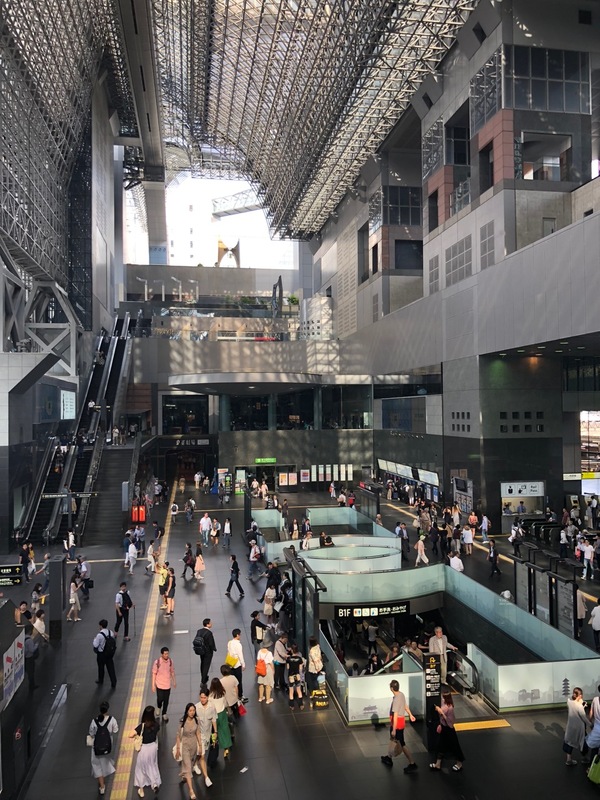 The second Kyoto Station was built in 1914 on a much grander scale. It was a spacious and elegant wooden Renaissance style building considered an object of pride by the national railway. Unfortunate choice of building material (cypress wood burns easily) caused complete destruction of the station in 1950 when somebody forgot to turn off an electric iron in one of its changing rooms. The replacement was built in a hurry. It was a functional concrete structure that served its purpose but was as exciting as a pile of bricks. With Shinkansen (bullet trains) and subway coming to the city, Kyoto needed a more visually appealing station. 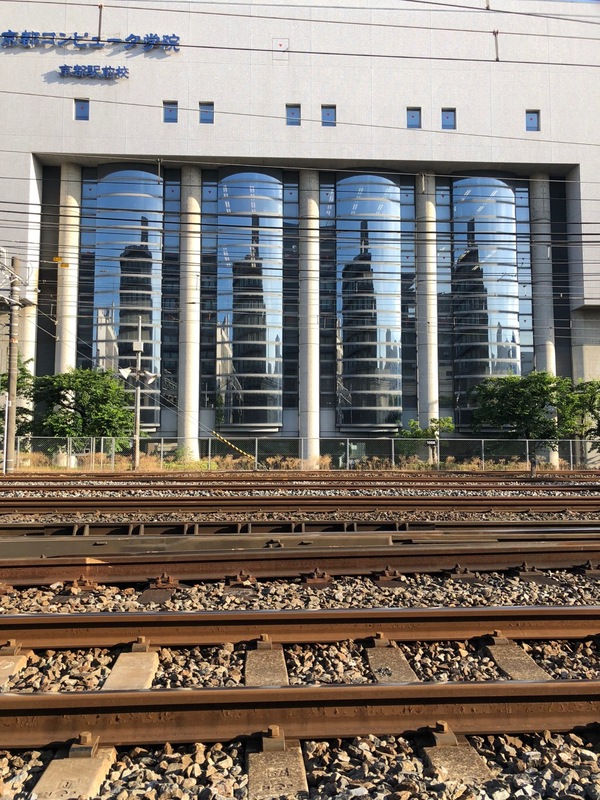 The new building was designed by the architect Hiroshi Hara and was completed in 1997. It was constructed to celebrate the 1200th anniversary of the foundation of the city. 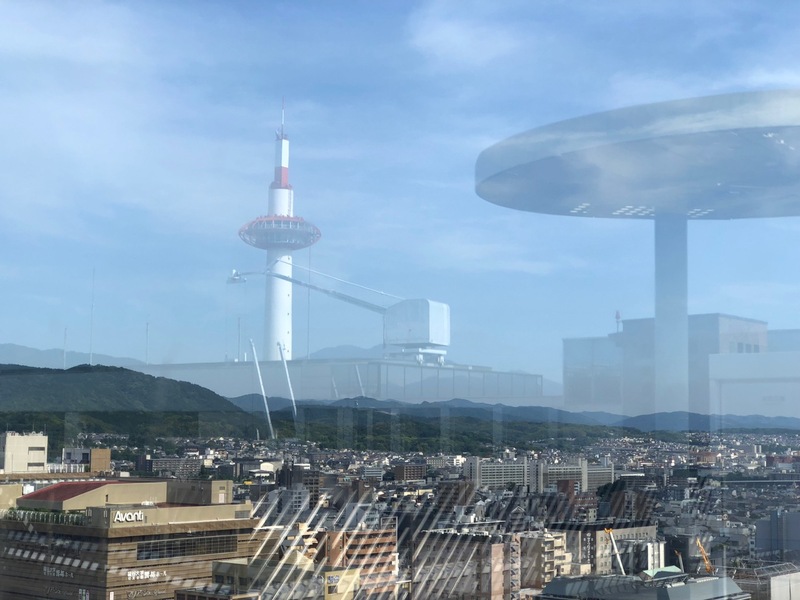 The enormous futuristic glass and steel structure was like nothing Kyoto had ever seen before. Even the architect himself admitted that perhaps the avant-garde complex was too ambitious for the ancient city at the time. Years passed, strong feelings somewhat subdued, although the building still has its critics. 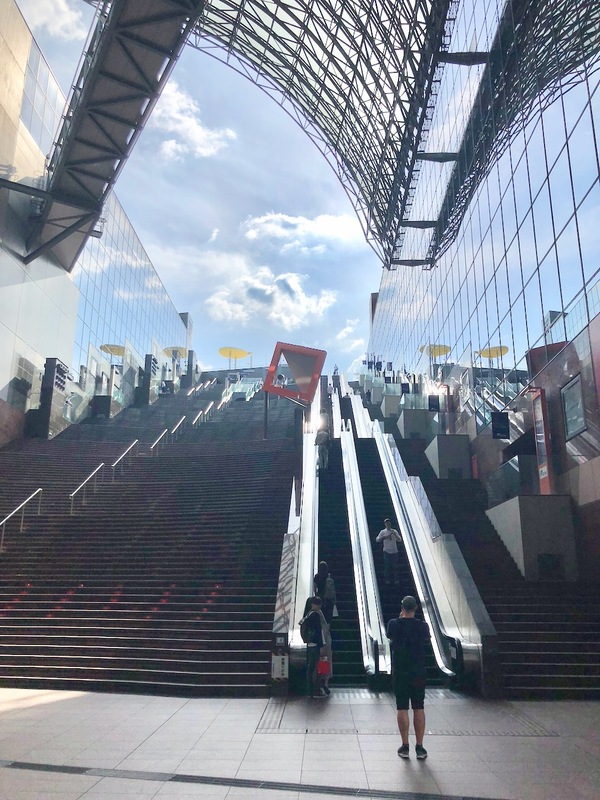 Nowadays, the majority of people see the 15-story station as a stunning way to arrive in the city of Kyoto. Speaking of arrivals and departures. I bet you are as fascinated with futuristic aspects of Japanese culture as I am if you managed to get this far through the post. Thus, why not jump on a Shinkansen train just for the sake of… well… out-of-this-world experience. No matter how many times I rode it, it never ceased to amaze me. All quiet and almost sleepy on inside while moving at nearly an airplane speed on the outside. Who needs a destination! Ok, ok, a spontaneous ride sounds too wild? Head to Tokyo instead. There are a few additional perks to this plan. On the way to the capital, you will pass through some famous sites (have you heard about Mount Fuji? Wink, wink). While waiting for the train, get inspired by some fun day trips from Tokyo. Hiroshi Hara is one of Japan’s leading architects. Trained at Tokyo University, he is one of the most accomplished representatives of avant-garde New Wave architects who became active in the late 1960s. 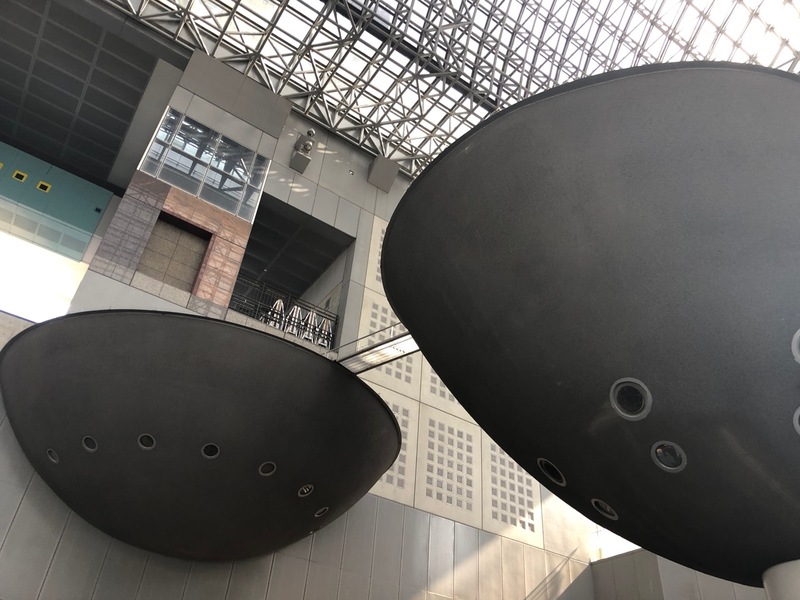 His major works include Kyoto Station, Umeda Sky building, and Sapporo Dome. In May 2008, The Times magazine listed Umeda Sky Building as one of the “World’s Top 20 Buildings” alongside the Parthenon, Taj Mahal, and Sagrada Familía. Since the 70s, Hiroshi Hara and his students spent almost 3 decades conducting surveys of villages in as many as 40 countries. He based his design theories on long-term studies of vernacular architecture and surveys’ analysis attempting to bring cultural relevance to modernism. Read more here. Some data outlining his work is available on archINFORM and Japan Architect. 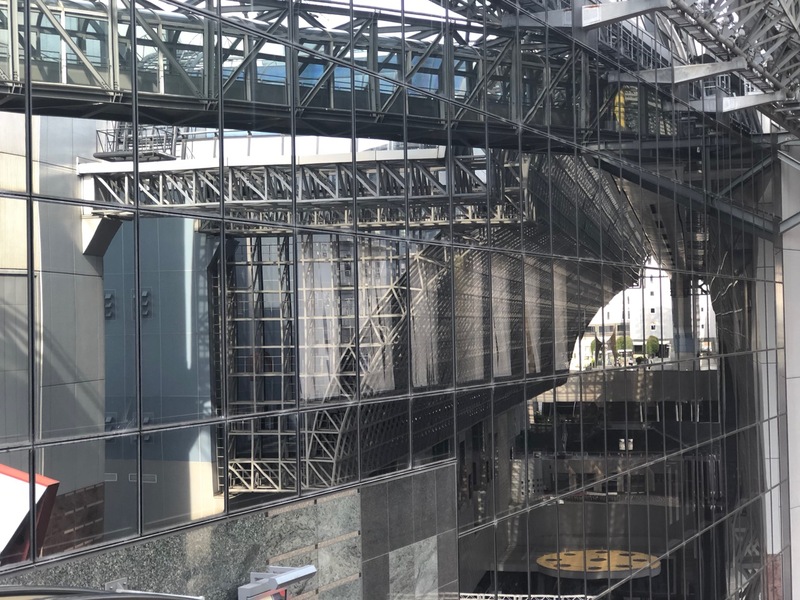 If you only use the platforms, you miss out to notice the best parts of the Kyoto Station building. 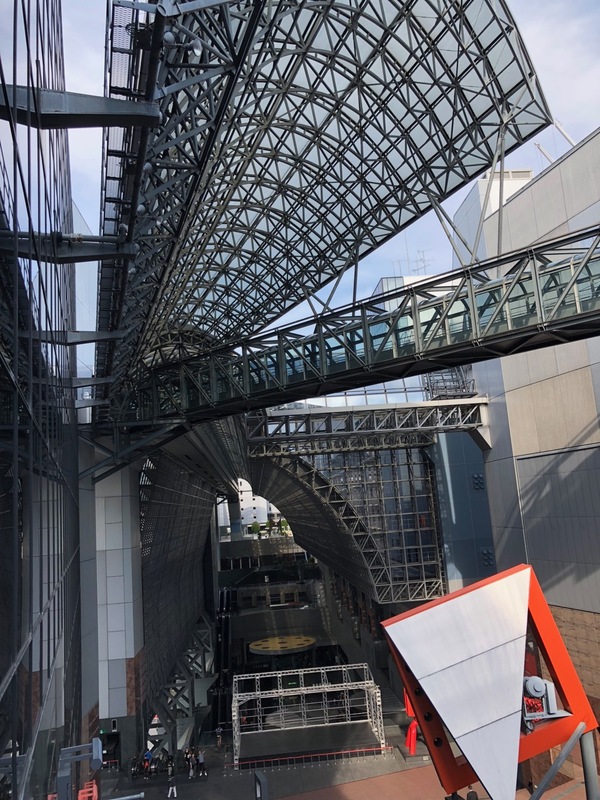 If you come by train and want to explore it, go to the North exit (Karasuma Side), and you will find yourself in the gigantic steel beamed atrium. Use escalators and walkways to stroll around and enjoy the 360-degree view of the building. 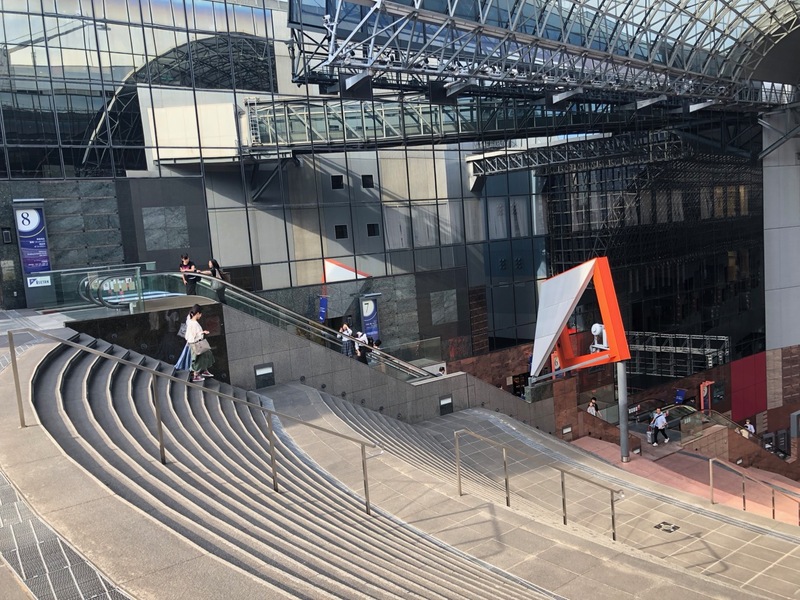 Do not forget to take an escalator (or an elevator inside Isetan Department store) all the way up to the Kyoto Station Sky Garden. It offers sweeping views of the city and a place to take a break surrounded by flowers and bamboo trees. Last but not least, it could get quite hot in the Sky Garden under the open sun. Ice cream would be nice. We stopped by at Country House Eikokuya, a British style tea shop on the eastern side of the 3rd floor with an outside patio overlooking the atrium. 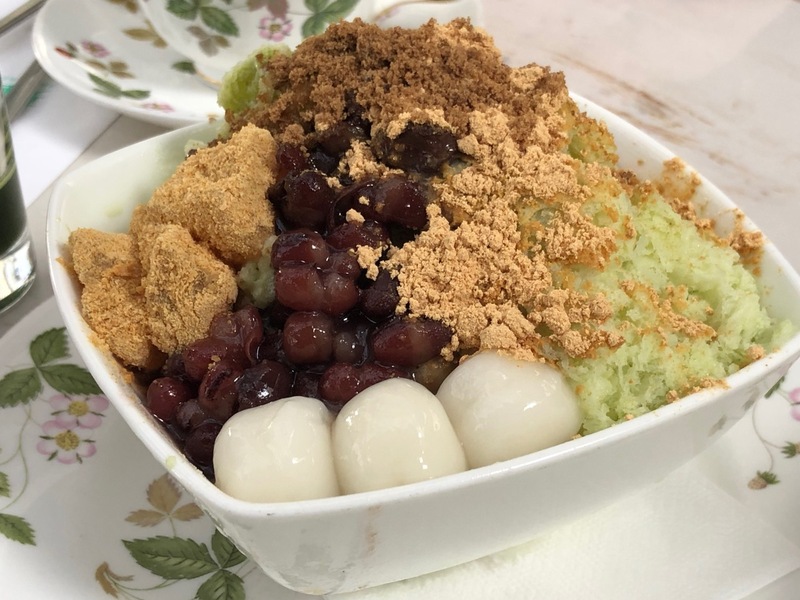 A cup of tea and a bowl of shaved green tea ice with mochi were excellent and brought me back to life. How cool Elena. Japan always fascinates me. Fabulous photo’s. Thank you so much for sharing ! !